In 1996 he embarked on a solo career with his solo 5-row accordion project, featuring extreme and original compositions, live loops and effects, a dynamic and animated stage performance, orchestrated lights and surround sound. This show received instant massive worldwide critical acclaim at WOMEX Berlin in 1999 and led to continuous work with his many projects all over Europe, North and South America, Israel, Russia and Japan to rave response. 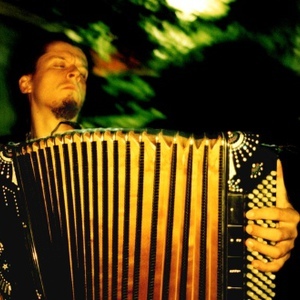 Pohjonen's singular mission is to expand the capabilities, sound, performance, scope and experience of the accordion in many different settings to levels never before seen or heard. Accordion, voice, effects, surround sound and light show combine to make a unique and captivating performance event. Named Folk Musician of the Year in Finland in 1996, 1997, 1998, he has played on over 75 different albums in the past 10 years including Finnish folk music group Ottopasuuna, duo pinnin pojat with JPP's Arto J?rvel? and rock band Ismo Alanko S&auml;&auml;ti&ouml;. Pohjonen has also performed music for theatre, ballet and modern dance. In 2001 he formed duo Kluster with sampling whiz Samuli Kosminen. Pohjonen's projects include concert collaborations with Kronos Quartet. Pohjonen and Kosminen have also teamed up with Pat Mastelotto and Trey Gunn of King Crimson for the quartet called KTU. Pohjonen also performs entirely improvised music with French percussionist Eric Echampard (see: Kimmo Pohjonen & Eric Echampard).